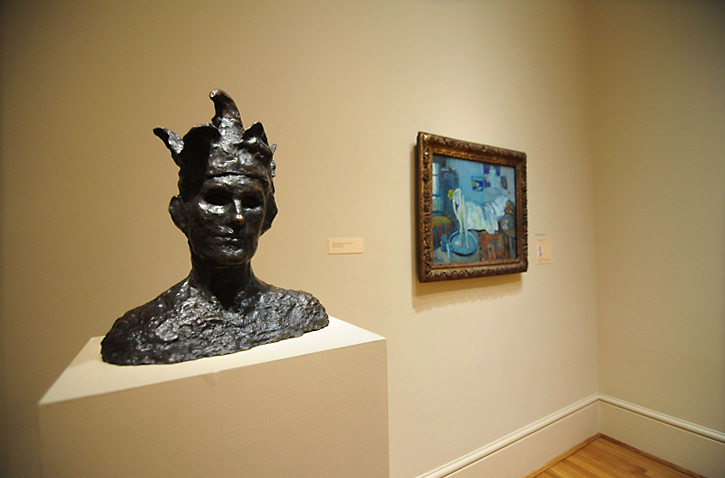 Curator Elsa Smithgall pairs two works by Picasso in her installation, History in the Making: 100 Years After the Armory Show, on view in the Main Gallery until January 5, 2014. In this series, Young Artists Exhibitions Program Coordinator Emily Bray profiles participants in the 2013 James McLaughlin Memorial Staff Show. Join us for the Staff Show reception on October 10, from 5:30 to 8 pm! A DC resident all of his life, Laurel Simon has lived around the urban lifestyle. After graduating Drew University with a Bachelor’s in Studio Art, he left with a heightened sense of the creative world around him. He is committed to art, with a focal point of oil on canvas paintings. Laurel relies on sneakers as the subject and portrays them in any fashion; be it on canvas, wood, or even as alternative sculpture. His priority is to complete narratives with sneakers, which come in all shapes, colors, and sizes and tell their own stories. In doing so, he hopes to display sneakers as an important part of not only urban fashion, but our lives. I work as a Museum Assistant. The job requires an extensive application of how to navigate through the building. Once that is mastered, the job becomes more enjoyable; each “building” is its own world, each “floor” is its own island. Edgar Degas is one I favor strongly; his Study Dance Rehearsal piece on view currently is a small yet detailed piece of work with a simple narrative. That and his other works of the dance make him a fine artist to focus on and learn about. What is your favorite gallery or space within The Phillips Collection? The Armory show features classic work from those of the avant-garde. That, paired with the Laib Wax Room, makes this area my favorite. What would you like people to know about your artwork on view in the 2013 Staff Show (and/or your work in general)? AirMax: left.for.dead is a piece I completed early this year. 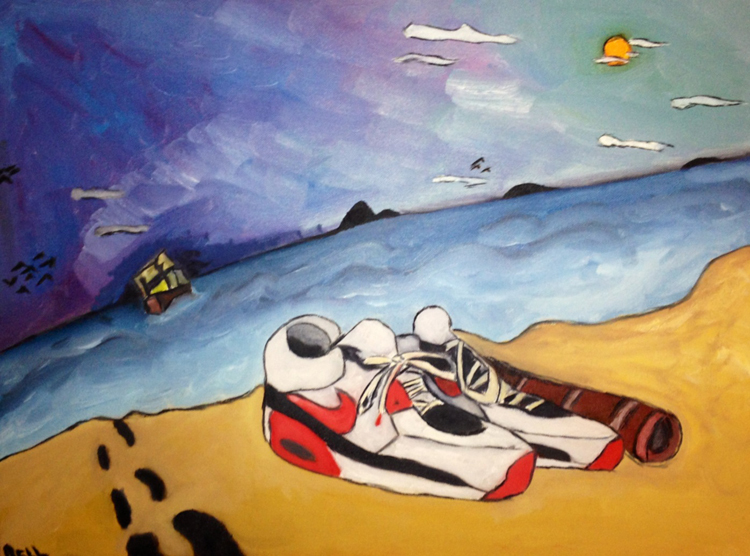 My idea was to add a narrative to a subject I mainly focus on: sneakers (shoes or “kicks”). My goal was to make the viewer fully interpret the scene; did someone high-tail it out of there, leaving behind some prized possessions? Was this person stranded on an island and found solace in an escape? Does this symbolize what we all go though in life: leaving something and moving on? I hope that people discuss with themselves what they think the motive in the story is as they look at the myriad of colors, the cel-shaded motif, hints of Cubism, Impressionism, and the emphasis on a popular brand of footwear. The 2013 James McLaughlin Memorial Staff Show will be on view September 23, 2013 through October 20, 2013. The show features artwork from Phillips Collection staff. It would appear that Duncan Phillips wasn’t one to travel without his diary either. Although perhaps not quite so scrupulous as Oscar Wilde’s Victorian characters, Phillips enjoyed the habit of journal keeping, from documenting voyages overseas to exacting notes on the price and shipment of a new work of art for his growing collection. 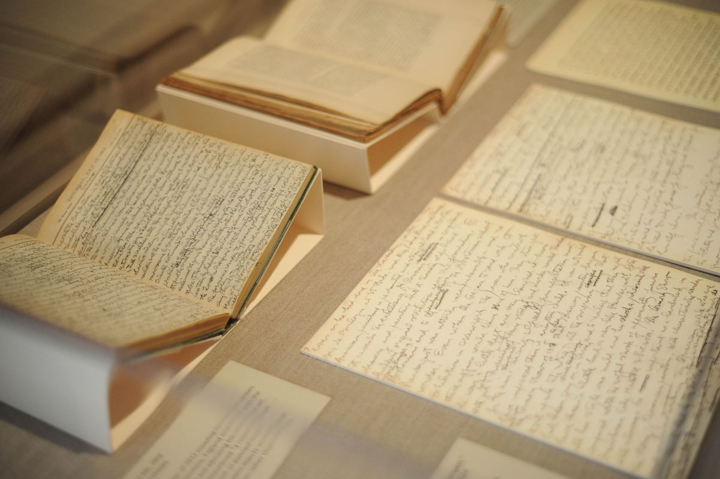 More than a century after Duncan Phillips began writing about art, The Phillips Collection has meticulously archived his diaries, daybooks, and drafts for later publications in its library. But Phillips wrote for more than his own personal satisfaction – it seems evident that his diaries were one place where Phillips grew from an admirer and collector to an esteemed critic of art. He edited his own journals, inserting marginalia and crossing out entire paragraphs or even pages as his ideas changed. Phillips’s publications sometimes developed over the course of several years; for example, his 1924 deluxe edition monograph on artist Arthur B. Davies was the result of thoughts and essays Phillips had written since 1916. The museum’s library and archives still contain each of these drafts, and of course, the final product which is now on display in History in the Making: 100 Years After the Armory Show. Perhaps most striking in Phillips’s thought is how it changed over time, especially with regard to works of art he saw in the 1913 Armory Show. This exhibition, which was lambasted by the press, was equally troubling to Phillips. But with time the young collector’s opinion changed. His journals and many drafts express this. Writing on the Armory Show in several drafts throughout the 1910s and 20s, Phillips first characterized the exhibition as “notorious,” then as “startling,” and finally as “sensational” in his Collection in the Making (1926). Furthermore, the artists that he had seen in 1913 became more palatable as he trained his eye as a collector. Matisse and Cézanne, whom he once decried as “damned fools,” became highlights of his collection. As a curatorial intern working on the Armory Show this summer, I had the chance to excavate the archives and help identify this dramatic shift in Phillips’s thinking. I have to say I agree with Gwendolyn, journals make for quite sensational reading.